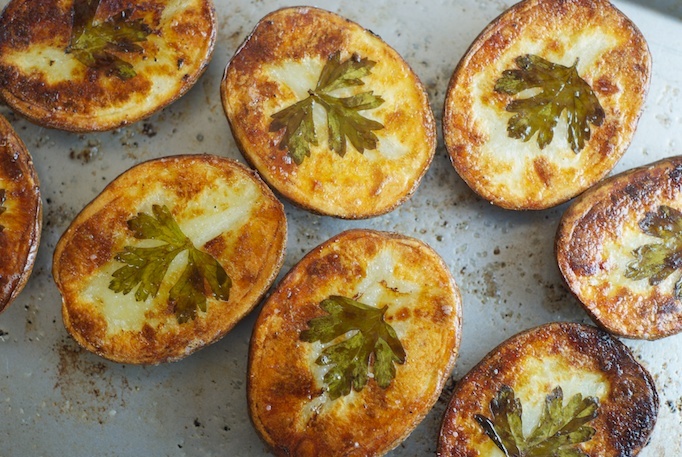 One of our favorite foods in this house is roasted, crispy potatoes. These potatoes are so simple to make, you could enjoy them any night of the week, but are so pretty they are a great company side dish. I’ve been making these for several years now, and they always get rave reviews from guests. 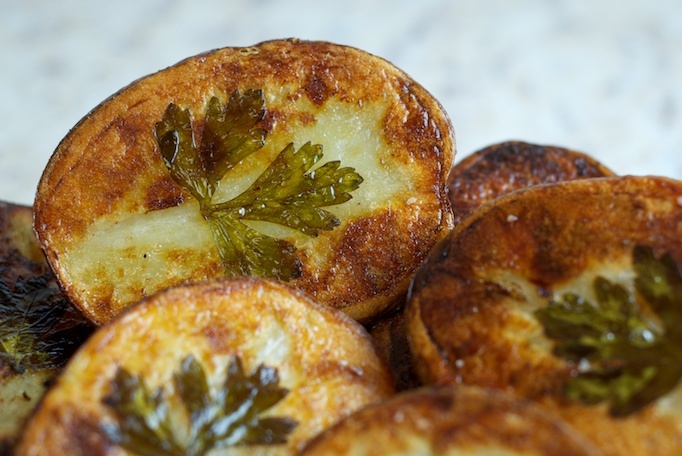 The tops of the potatoes are caramelized and crispy, with a creamy soft center. I changed the amount of butter in this recipe significantly, and added a little olive oil, to help keep the butter from browning too much. Also, you will notice that I have provided a large window for the baking time. 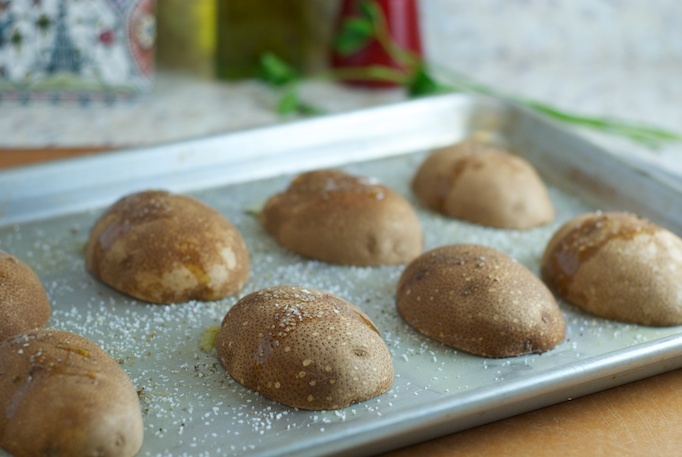 The baking time will be completely dependent on the size and thickness of your potatoes. Put oven rack in middle position and preheat oven to 450°F. Pour butter and oil into a medium shallow baking pan (1 inch deep) and tilt to coat bottom. Season bottom of pan with kosher salt (this is much easier than salting the potatoes cut side up and then turning them over). 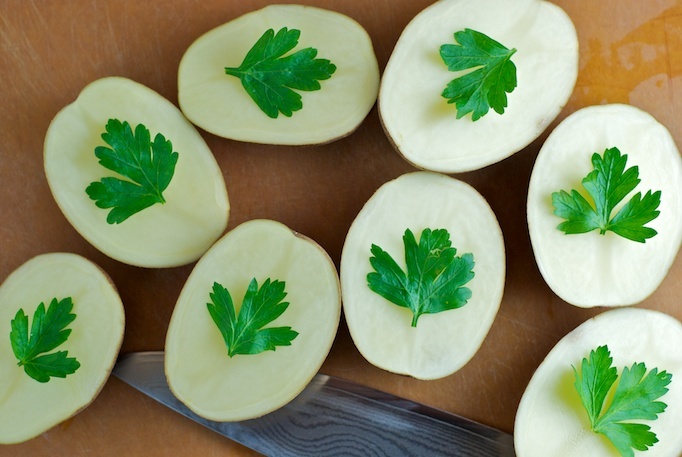 Halve potatoes lengthwise, then put a parsley leaf on cut side of each potato, and turn over, cut side down, onto baking sheet. Drizzle tops of potatoes just slightly with olive oil, then add salt and pepper to taste. Roast cut side down (do not turn over) until undersides are golden and potatoes are tender, 30-45 minutes (depending on your potato size and thickness when cut). 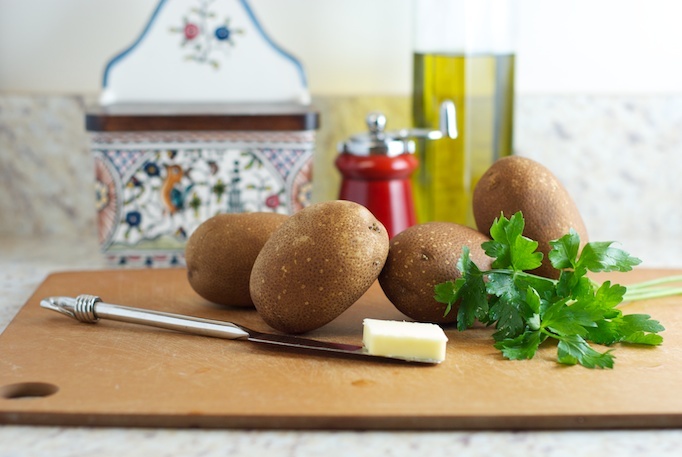 When the potatoes have formed the roasted crust they should lift fairly easily from your pan; if the potatoes are sticking and hard to turn over, it is more than likely that they have not formed a proper crust yet.